So this coming Saturday the 18th, we’re playing at Café Nine (on the corner of State and Crown streets) in New Haven – the objective, to raise funds for the city’s St-Patrick’s Day parade. 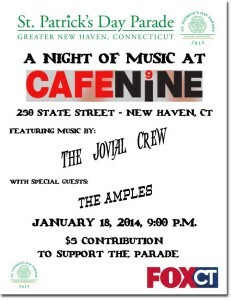 We’ll arrive to set up around 8, the show begins with the band The Amples and then we’ll do a couple of sets. It’s a bar, so only 21 and older, please. Come on down, all our fans from the New Haven area – this is another opportunity to participate with us on your home turf! Check the flier here for details. This entry was posted in Uncategorized on 14/01/2014 by JosMorn.